News from All Access today reported that National Public Radio is dropping their current underwriting voice talent. They have one in the interim but it sounds like they may be willing to audition other voices. They seem to want a female voice. Go get ’em, ladies (and no I don’t know where to send you — you have to do SOME work here). Now while you ladies are practicing saying “This is NPR. 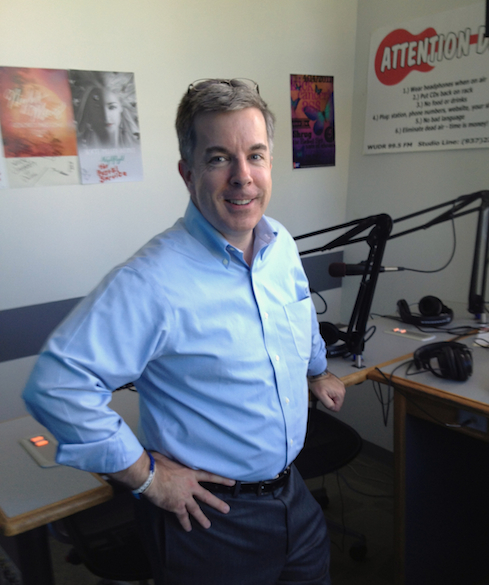 National Public Radio” I’d like to address this change of voice talent at NPR. The long time underwriting voice talent for NPR was a gentleman named Frank Tavares, who had been the underwriting voice talent for a reported 31 years. He was great but a change was made and that’s showbiz. The network’s idea, it would seem, was to insert a cost-saving move while also vocally changing things up a bit by adding a female voice. OK, no problem there. 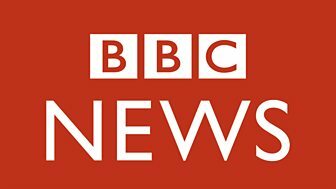 Auditions were held and the winning voice talent was an actress named Sabrina Farhi, who started on NPR in October 2013. Her NPR underwriting reads were awful. Dreadful. Like nails on an angry chalkboard. And none of the bad NPR reads were her fault. Repeat, NONE of them! I can prove it. I’d heard Sabrina’s underwriting reads and could not get past the horrible, robotic read she voiced. This was the winner? Didn’t anyone else hear how tone deaf and unlistenable these underwriting reads sounded? So after a while, during the few times I actually listened to NPR, I just switched away during the underwriting reads. Not what the network wanted, I’m sure. But I assumed it was just my professional ear not being able to grasp what the network was looking for. Maybe I was missing the musicality of it all. Certainly, I’d been wrong before (I told myself) and maybe I’m wrong on this. Well, given the announced change, I guess not. However, after reading tonight’s news on the change at NPR, I went to Sabrina Farhi’s web site and listened to her commercial voice-over demo. I couldn’t figure out how this voice got hired! Sabrina Farhi has a wonderful voice which offers a clean, thoughtful interpretation of copy. 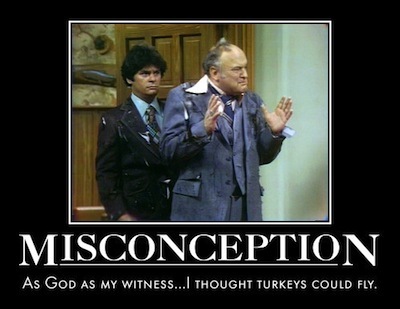 The voice I heard on the TIAA CREF commercial was NOT the read I heard for the NPR underwriting voice-overs. So my professional experience leads me to believe that it’s not the voice talent that’s at fault in this case, it’s the producers. Yup, somebody either in underwriting production or in the underwriting department directed Sabrina to read in a monotone, cold and oblivious way that was evidently unlistenable to more people than just me. The underwriting voice for NPR has to have a certain authority to it, yes, but NPR (more than any broadcast network) has a kind of humanism attached to it (in my opinion, anyway) that needs to be conveyed in the voice of the radio network. Frank did a great job doing that and Sabrina probably could have too if someone was directing her correctly. So now it’s been announced that voice talent Jessica Hansen will serve as NPR’s underwriting announcer in a trail run beginning this month. Here’s hoping that she gets a new director who better understands voice-over direction, voice talents in general and the NPR brand. When I left the University of Dayton in Dayton, Ohio in April, 1986 with my Bachelor of Arts degree in Radio and Television, I was just about as clueless as I am now. The only difference being that now I realize how much I don’t know. Back then, like almost everybody else who graduates at any time in history, you just don’t know. All I knew was that I wanted to make a career for myself in radio. That was not what life had in store for me. So much for plans. I hadn’t been back to Dayton and UD specifically in at least 20 years, so when I had the opportunity to go back this fall on business, I of course took a few minutes to go back to U.D. 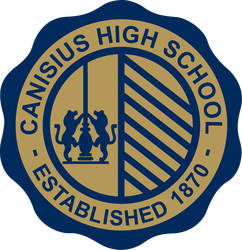 Rather than talk about all the amazing things I saw, I will say only this: the school would never accept me as a student today. No way. Of course, my professional broadcasting career started at the University of Dayton – it’s where I first got a paycheck for talking into a microphone. I started at a little carrier-current radio station (technically it was one step above tying two strings together with tin cans at either end) called WDCR. 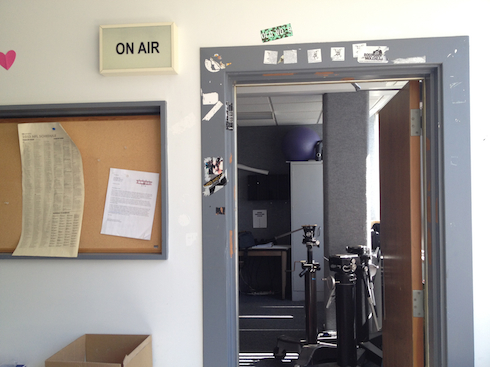 It was, as the above picture might indicate, a roomy closet of a radio station but for me it was home. And I thought I was in hog heaven. I was working with people like Tracy Hurd, Scott Rolle, Jim Secunde, Dan Suffoletto, Joe Lombardi, Ginny Judge, Lisa Curie, Liz Benz and Mark Kraus (as well as others I am ignorantly and regretfully omitting). 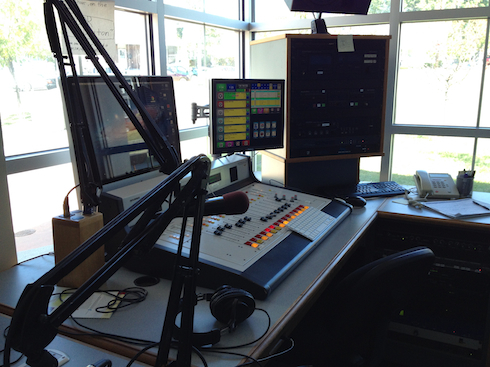 I was extremely fortunate to have joined on with that station when I did…wonderful people. But then in late fall of ’82, I got called up to “the big show”. WVUD-FM Kettering/Dayton was a 50,000 watt hot AC formatted radio station covering 3 states and they needed an afternoon news announcer. 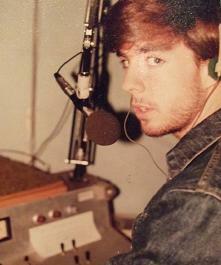 With my extensive news background (uh, none) I was brought on to bring the days news to the Miami Valley. To say I sucked at it was an understatement but I was happy —at least when I forgot to be scared to death about the fraud I was committing daily (pretending to know what I was doing on-air). Sometime after that I was given a regular disc jockey shift (weeknights from 6:00 p.m. – 9:00 p.m.), then moved into the production manager job (after something blew-up in the production department while I was away on vacation). My passion for voice-over kicked around this time too. Then I was made host of the all-request oldies show on Saturday nights (which was the #1 show in the market and the only decent ratings the station got – just the facts, folks). So by the time I left in ’86, I’d had quite a run. I knew I was happy doing all that but I didn’t realize just how happy….like probably one of the best times of my entire life happy, looking back. Not too long after I graduated, the University decided to get out of the broadcasting business and sold WVUD to Clear Channel. 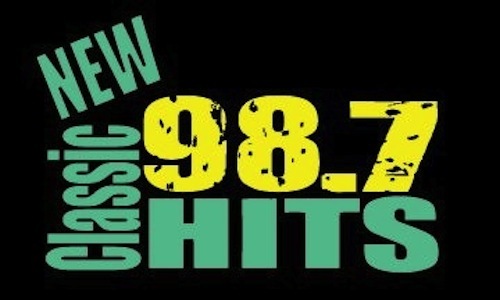 The station was an AC leader in the market for a lot of years as WLQT (Lite 99.9). 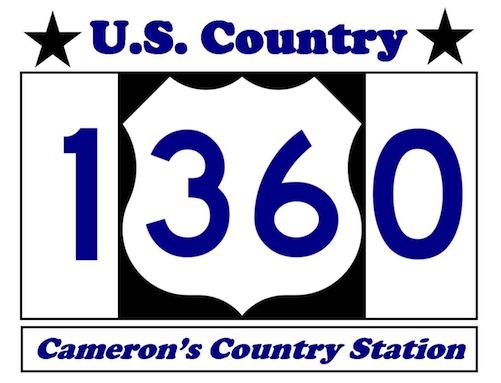 But evidently fortunes changed and it switched to country this summer (and a new frequency) as B-94.5 (with one of the crappiest logos in all of radio and that’s saying something). So going back to U.D. 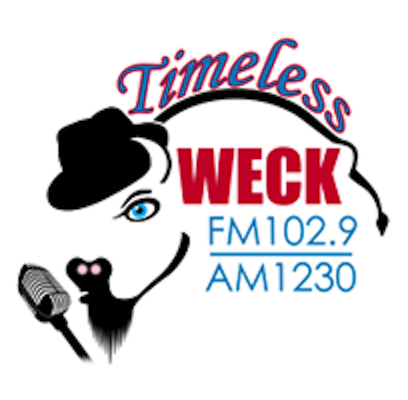 on this trip, I knew I was not going to find a radio station there (the WVUD calls are now owned by the University of Delaware). But I did find the echos of a special time for those of us who worked there. It’s both cool and sad to see it now. For example, when WVUD left, the school crafted a bigger, better school station named WUDR that they took to the off campus housing area known as “The Ghetto”. U.D. has tried to rename it as something like “The Village” but it’s still The Ghetto – only with nicer houses. I’ll talk about WUDR in a moment. 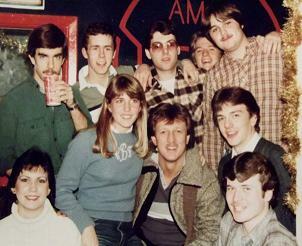 So for folks who worked at WVUD, these next photos will bring back some memories…. This, for example, is where WDCR once stood (as well as an ATM). But not any more. 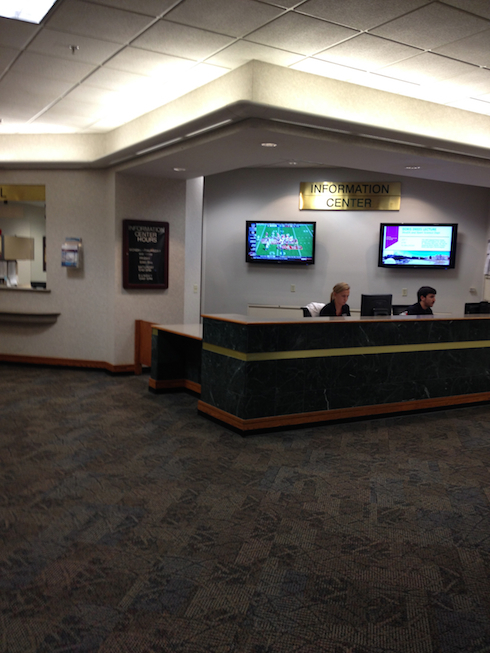 And just to the left of this is a Kinkos kind of copy store, right in the union. 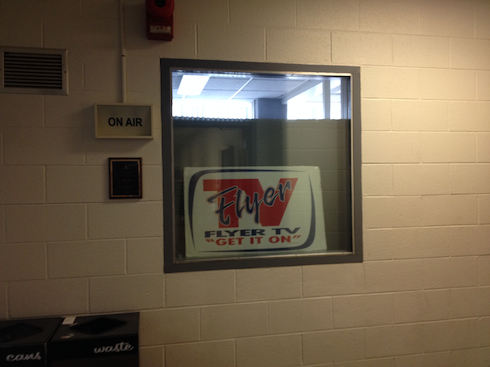 This will be a familiar sight for many…this is the window in Kennedy Union that looked into the on-air studio. I remember taking a tour as a high school student and looking through this window and thinking “OK, I think I need to go to school here.” I believe my tour guide was Libbi Richmond (now Keating). (this room) the only audio thing left in the area. In this area, the some of the transmitter equipment, processors and satellite receivers and recorders were located…along with the last of its kind teletype from either UPI or AP….I can’t remember. The engineer’s office was out there, the guys who kept us on the air like Bob White. From here it was on to the studio…. 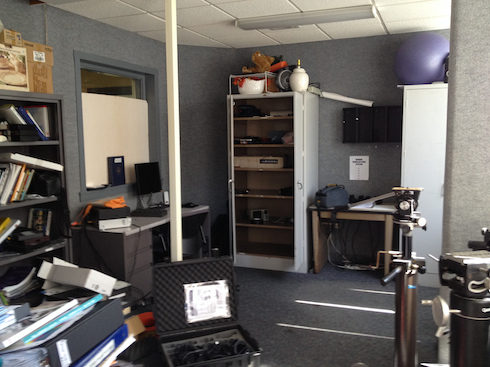 What is now home to more storage (including a large purple exercise ball…as TV people – unlike radio people – evidently like to stay in shape) used to be what you saw as you came into the main air studio. 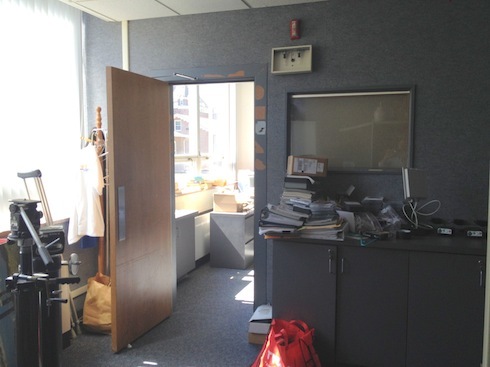 That window you see in the back corner is the same one featured in that black and white picture above of me on the air at WVUD. 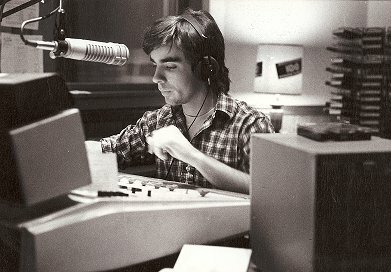 I don’t recall that white post being in the studio but to the right of it would have been the main announcer console and to the left of it was the news announcing locations (with two mics, for that brief time WVUD had Rod Sommer doing morning news and John Condit doing morning sports with Mike McMurray as the morning host). And when you were sitting at the main announcer console, this was the view you had looking out into the entry way. It was at this console where talented on-air people worked including John Luttrell (who I know gave me my first shift at WDCR and who I think helped get me my job at WVUD), Sandy Huff, Ron Alexander, Jeff Wagner, Clare Bracken, Luanne Seethaler, Pat Haverland, Mary Haines, Gordon Smith, Troy Christopher and many others (who I am irresponsibly forgetting) broadcast the sounds of FM-100, Hitradio 100, Today’s Music 99.9 FM and probably a few other monikers I am forgetting. We can’t go back in time and we shouldn’t but for a little while on this trip, I did anyway. Would that I had the opportunity, I would tell my 1982-self to just focus on everything that I was experiencing and enjoy it a little more, listen a little more because it certainly was a gift, getting to learn from all those people. As a recipient, I was not nearly humble enough. But the story doesn’t end here. 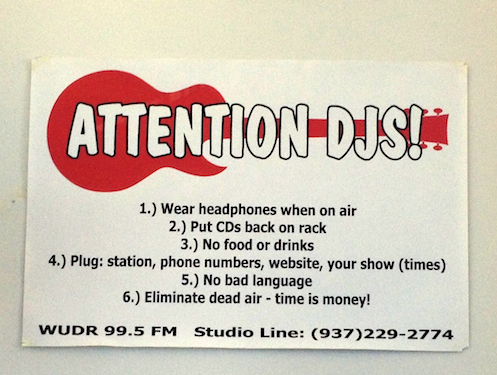 Remember I mentioned the University does have a radio station, WUDR. The studio is off campus in a cool area called Artstreet, right in the middle of the UD Ghetto. 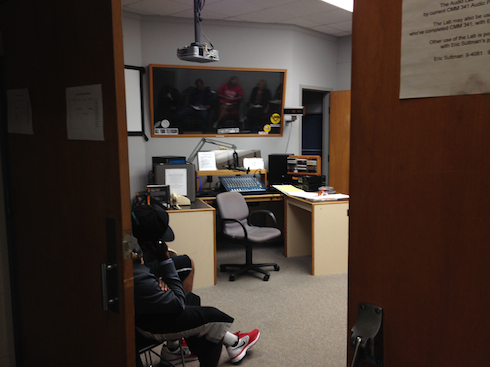 Compared to WDCR’s studio, their studios are like penthouse suites! The general manager of the station is a student named Carson Smith, a very nice guy who had the misfortune to be in the station when I dropped by asking all kinds of questions. He was very patient. I kept saying weird stuff like “you have no idea how nice the station’s equipment is!” And, “you have computers here? 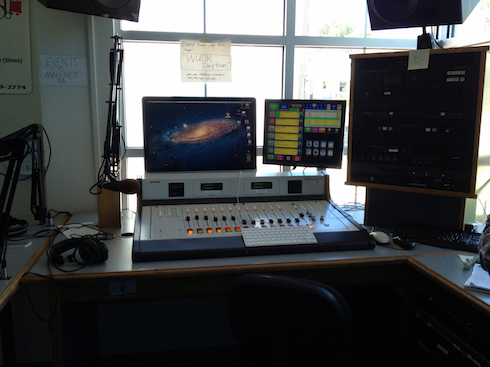 !” It was very nice in there, considering what student radio used to be like at UD. Oy! Like I said, he was very patient, having no idea who I was and whether or not he should call campus security (he didn’t cause he couldn’t find his cell phone). It was nice to see that, in spite of its challenges, there are still people at UD who care about radio, even though students today don’t know very much at all about the University’s impressive radio history (and that’s the Communication Department’s fault – whom I’m guessing really don’t care if said blame lands at their feet). One final note though, in spite of appearances, money is extremely tight for WUDR and they could use all the financial support they can get. There are alot of places at UD asking for money BUT, if you could funnel your regular UD donations directly to WUDR, a little would go a LONG way for them. And this is me making the ask on their behalf, I was not put up to this by Carson or anyone at UD. Every year I still enjoy this wonderful piece of TV and I hope you do too. Please share this post with your social media voice-over friends!